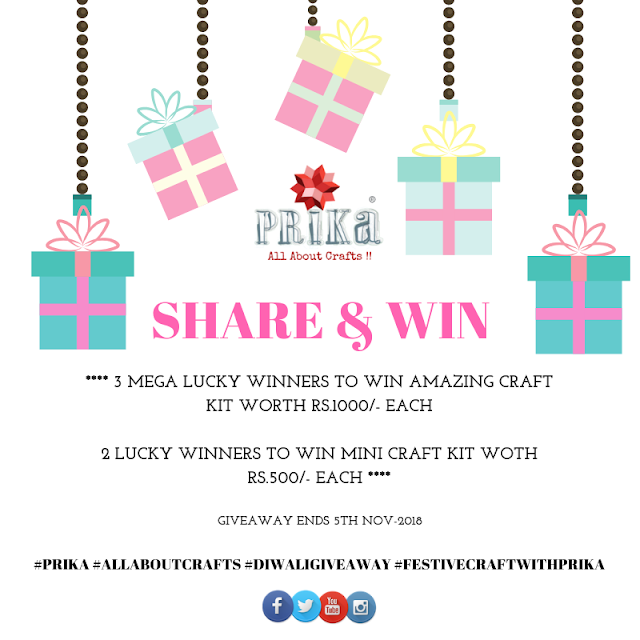 Prika: Share & Win with Prika Diwali Giveaway! Festivities has already began since we all have started to be prepared for the most happening and biggest event of the year…. the festival of Diwali….we just thought to make it a little special for all the amazing crafter around us!! ➤ Like our Facebook page and let your friends also know about us by inviting them to like our page. ➤ Rate and Review us on Facebook sharing your experience and letting us know what you like about us or any product of ours. Do let us know you have completed all steps by commenting “Done” below…on this blog post of Facebook post. This giveaway ends on 2nd November and results to be announced on 5th November!! Wow 😍😍😍😍 ....it's time for giveaway...I just love that .... Thanks for this opportunity to us . And best wishes. May God fullfill your all desire. And you will give us this type of opportunity again and again 🥰 . All steps done by heart ❤️. Yes - the happiest time of year and I'll be a busy bee. I love Prika's products. Thank you for the opportunity to be a happy winner! Thanks for the amazing giveaway and making diwali special...would love to win these goodies.